The co-partners of #CripTheVote, Gregg Beratan, Andrew Pulrang, and Alice Wong, invite you to reflect on the first hundred days of the current Presidential Administration. Joining us as guest hosts are Aditi Juneja, Co-Creator of the Resistance Manual and Co-Host of Self Care Sundays podcast, Serene Vannoy, Disability Rights Team Lead of the Resistance Manual, and Michele Kaplan, activist and creator of the What Is Ableism outreach project. Please note this chat will be 75 minutes long instead of 1 hour. Welcome to the #CripTheVote chat looking back at the first 100 days of the current Presidential Administration. We are pleased to have guest hosts @AditiJuneja3 @serenevannoy and @RebelWheelsNYC with us today! 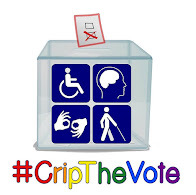 Please remember to use the #CripTheVote hashtag when you tweet. FYI: today’s chat will be 75 min long. 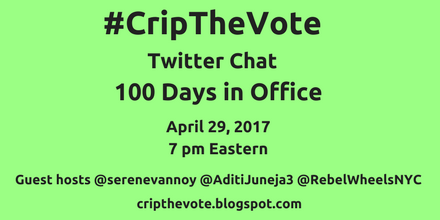 This concludes the #CripTheVote chat on the 1st 100 days. Thank you to our guest hosts @serenevannoy @AditiJuneja3 & @RebelWheelsNYC!